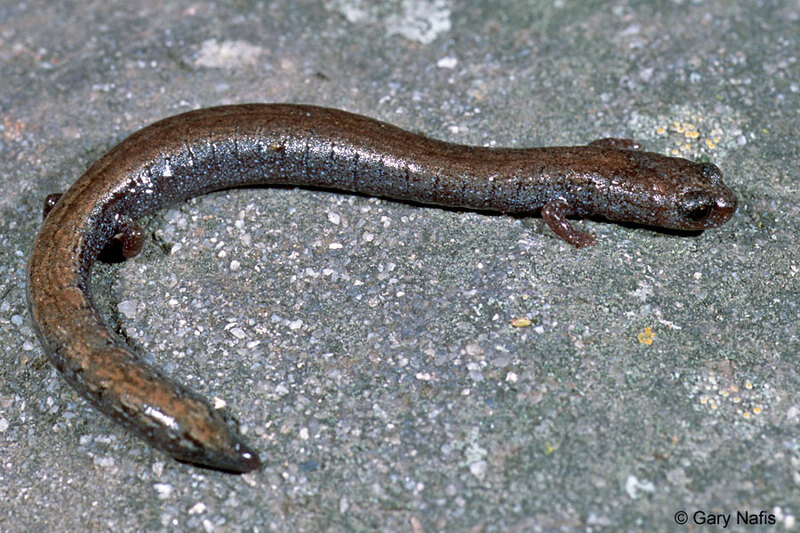 Slender Salmanders (genus Batrachoseps) have only 4 toes on their hind feet. 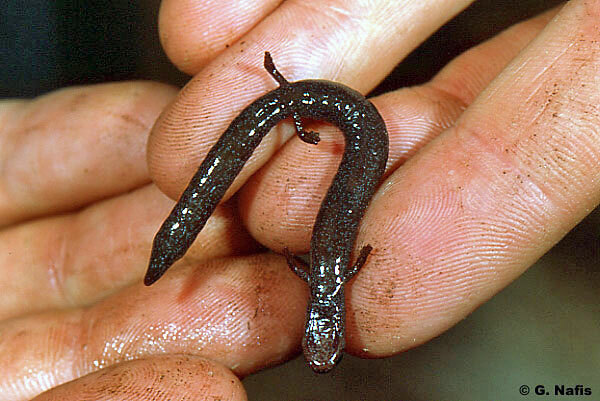 All other California salamanders have 5 toes on their hind feet. 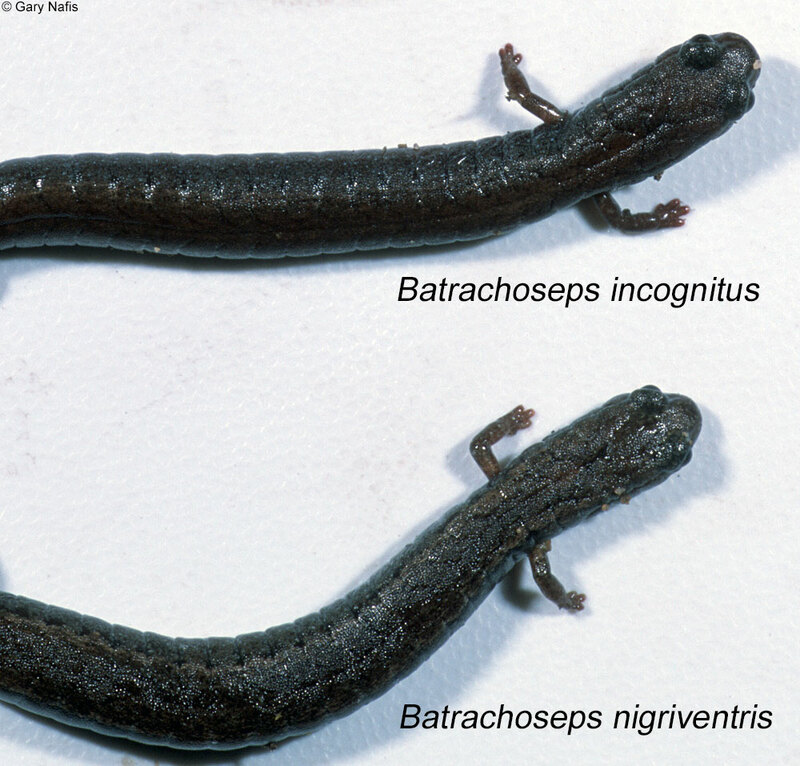 The Black-bellied Slender Salamander, Batrachoseps nigriventris, shown above on the bottom, occurs in most of the range of B. incognitus, shown on the top. 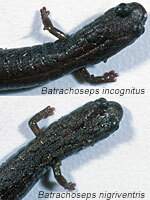 Their appearance is very similar, but B. incognitus has slightly larger legs, toes and neck. Adults are 1 1/2 - 1 9/10 inches long (3.8 - 4.8 cm) from snout to vent. 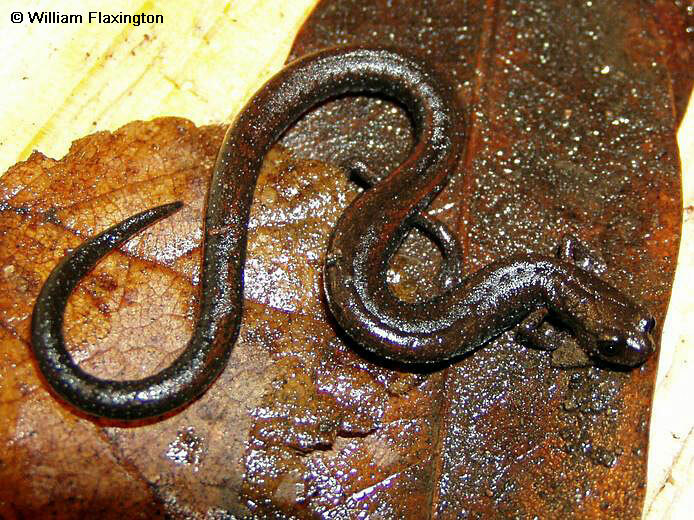 A small thin salamander with 18-20 costal grooves. 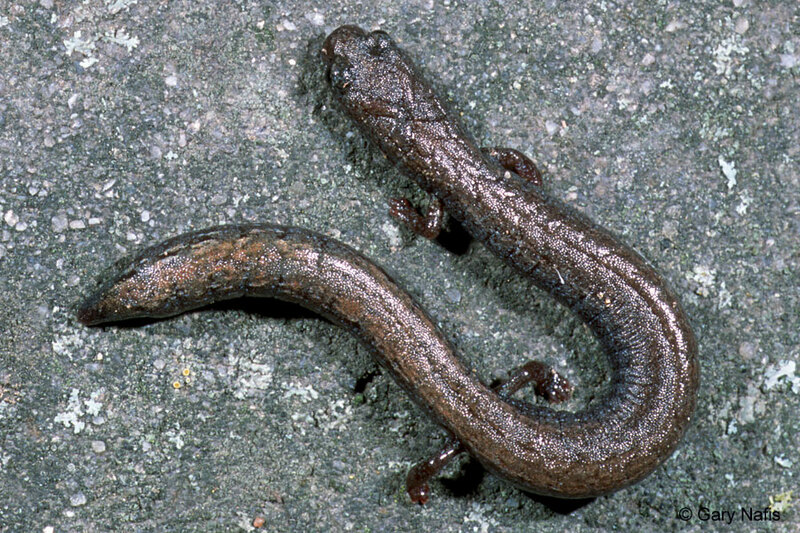 There are four toes on the front and hind feet, which is typical of all Slender Salamanders. Ground color is dark grey to brown or reddish brown. There may be a faint dorsal stripe. The venter is lighter in color than the dorsum and finely speckled. Co-exists with B. nigriventris in some areas. 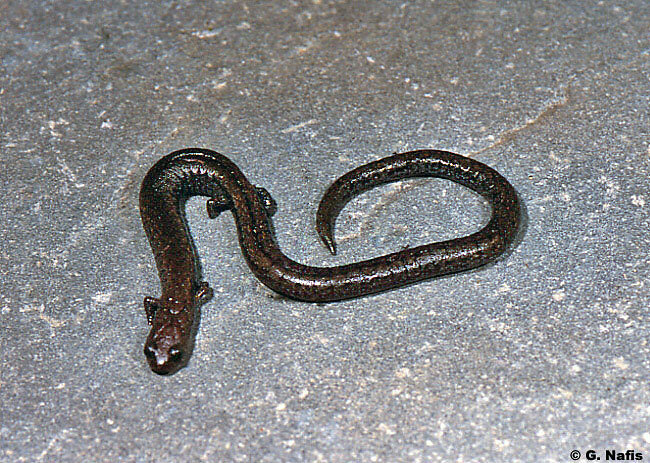 B. incognitus is the larger, more robust, of the two species, with longer limbs and a broader neck and head than B. nigriventris. The digits of the toes are individually distinct, and easier to see when compared to B. nigriventris which has smaller digits. Surface acivity has been observed from mid January to early June, but activity probably begins with the first fall precipitation in October or November and may continue after the rains when cool temperatures and moisture are provided by marine fog drip. Usually found under rocks, logs, bark, and other debris. Probably eats a variety of small invertebrates. Feeding behavior is not known, but other Batrachoseps species are sit-and-wait predators that use a projectile tongue to catch prey. Typically, Batrachoseps females lay eggs in moist places underground. 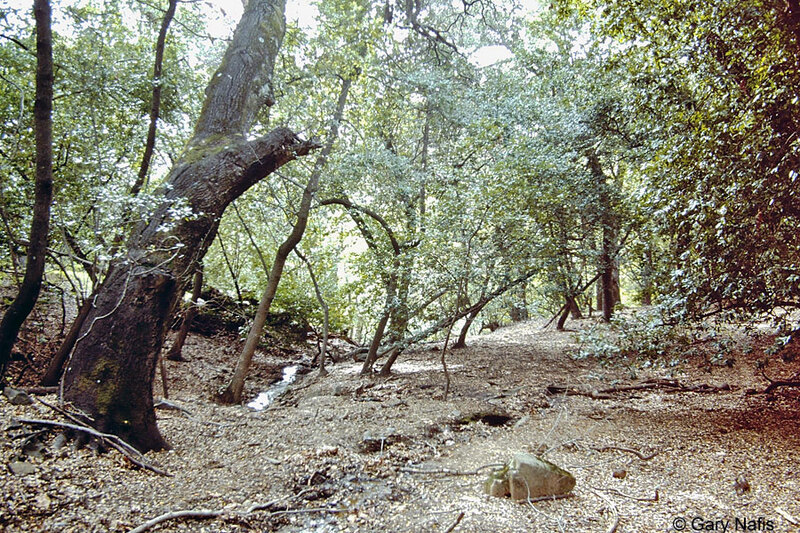 Inhabits open and closed forests of yellow pine, laurel, sycamore, and oak woodland. Endemic to the central coast of California. 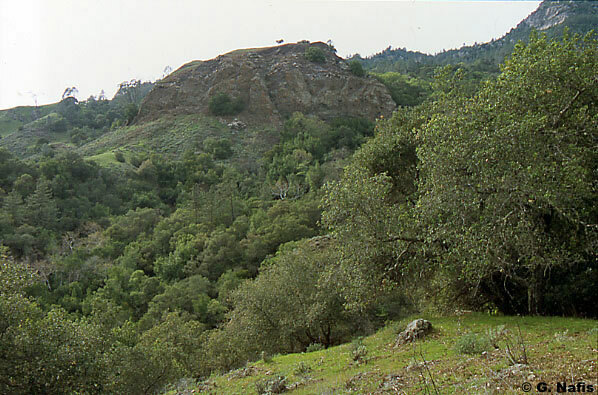 Found only in the Santa Lucia Mountains in northwestern San Luis Obispo County and extreme southwestern Monterey County, where the mountains meet the ocean. No significant threats are known to this species, but its small range on mostly private property and its similarity to other species make it difficult to survey and get a clear picture of its status. species, and to its small geographic range. Imperiled in the state because of rarity due to very restricted range, very few populations (often 20 or fewer), steep declines, or other factors making it very vulnerable to extirpation from the state.